There is a reason why proving shelter is called “putting a roof over your head”. Since the age of cavemen, roofs have been symbolic with safety and security. They have kept the elements at bay for millennia and continue to do so till today. Over time though, the roofing has undergone changes, with different types of roofs coming up and different materials being used. People use plastic polymers, asphalt, tiles and naturally occurring materials such as wood and slate. In Australia, the materials currently favoured for home roofing are metal sheets, terracotta and concrete tiles. These are able to withstand the harsher climates found here. Roof maintenance is expensive. It is especially expensive if you have a roof made from expensive material, but was made with shoddy workmanship. Roofing with lower quality material such as ply will also be expensive in the long run, as you might have to replace your entire roof at some point. Investing in a quality roof means that it will take time before you have to repair any cracks and leaks. It also means the roof flashings and gutters if any, stay in place and require lower maintenance as well. In Australia, the weather takes various extremes. From temperature changes, to torrential rain, it is important that your roof is capable of handling it. Quality roofing material will be able to withstand these conditions for a long time. Investing in a quality roofing service means that they will be able to take into account the climate of the area. They also factor in any potential stresses this might put on your roof’s design, and construction and adjust accordingly. In a land where almost any animal has the potential to harm you, roofing in Australia should be considered as priority one. A quality roof should also be able to shield you from animal attacks as well. One of the qualities of a quality roof is that it comes with warranties. It means that your roofing service has enough confidence in both their work and the materials they used, to give you a guarantee. 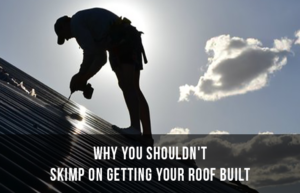 Skimping on the quality of your roof, either in terms of material or labour, means that you will miss out on the safety of having a warranty. This means that any adjustments, repairs or modifications needed have to be taken out of pocket, which is a costly endeavour in itself. Your roof is a huge part of the exterior of your house. As such, it should complement our home in terms of colour and design. Dealing with a reputable roofing service will guarantee that you get a roof that meets these conditions. It will of course cost more to put up, but that means you will have a wider range of options in terms of the colours, material and styles that they work with. It also means they will consider your architectural design when helping you choose these styles, instead of trying to make any style fit. One of the most important questions you should ask yourself is whether your roof will last long. When spending on a roof, always look for one that will last for years, without looking at the price it will cost you to install. The savings you make alone on the cost of repairs or replacements will in time prove to be the best decision. This means that materials such as metal and slate are especially recommended as they tend to last longer, regardless of the punishing Australian weather. As more people are looking to cut utility costs and bills, it is important that you consider spending money on an energy efficient roof. They provide better air flow, without compromising on temperature control depending on the weather. You should however ensure that your roofing contractor is actually licensed to install such roofs, and has a good record with them.